In a new interview and campus tour for the WSJ, Apple Chief Design Officer Jonathan Ive, along with some other high-profile officials, has shared some remarkable insight into the latest developments surrounding the company's long-anticipated, out-of-this-world new headquarters. The ring-like structure has attracted a ton of interest over the years for its peculiar shape and sheer enormity. In what is one of the most impressive architectural projects of late, Apple's chiefs view the new campus, now officially called Apple Park, as a defining asset which will serve for generations of Apple employees going forward. Once it's finally been opened for business in a few months from now, some 12,000 Apple employees are expected to move in, with one of the last groups being Jony Ive's own top-secret design studio. Apple Park is going to be a four-story building: not as low as Ive hoped, but still compact enough so elevators wouldn't have to be used too often. A core principle around which the work places have been designed is movement: co-workers would be expected to just stand up and walk to someone they want to talk to, to a conference room, cafeteria, or wherever they feel like going. This happens to be in line with Apple's current fitness-centric efforts, spearheaded by the Apple Watch wearable. In relation to this, the simple and stylish desks to be used at this new workplace will be height-adjustable, so with just a push of a button, employees will be able to transform them into standing desks. The frequent alteration of sitting and standing position is key to the body's wellbeing. Curved glass encompassing the ring-shaped building reflects the surrounding vegetation. Ive himself showcased strong fitness during his meetup with the reporters from WSJ, with his Apple Watch Edition measuring a good 88 bpm heart rate as he casually gulped down a couple of double espressos. Well, gotta be able to take it if you're the chief designer of the most design-focused company in tech! Employee wellbeing at Apple Park continues with the nature-friendly environment facilitated by the ring shape and the ample use of glass. While the structure itself can be viewed as an embodiment of signature Apple design vocabulary, with tons of curved glass, clean, polished, and understated floor and wall surface tones, Steve Jobs himself wanted the workplace to feel like it's embraced by nature. This is why the lush parkland around (and within) the campus will feel so immediate to those looking from within. An accent has been put on the abundance of natural light, while the company has also invested in a state-of-the-art ventilation system which constantly feeds the halls with fresh air and keeps the temperature within very comfortable levels (68 to 77 degrees Fahrenheit | 20 - 25 degrees Celsius). The $5 billion project has allowed Jony Ive to leave his mark on yet another ambitious undertaking that actually has almost nothing to do with his day-to-day job, which is to create industry-leading computing products. Right now, we can imagine most of the focus at Apple is on the upcoming iPhone 8 – a special iPhone edition to commemorate the breakthrough smartphone series' 10th anniversary. Rumors and leaks about this next-generation smartphone are becoming more persistent by the day, which has allowed us to formulate solid expectations for the device's key features, which seem to include an almost all-screen front side, fingerprint scanner hidden behind the screen itself, a cutting edge chipset, dual camera for effortless zoom and quality portrait pictures, enhanced battery life, and a range of new software capabilities. Check out our compilation of 8 most delicious iPhone 8 features we can't wait to sink our teeth in. 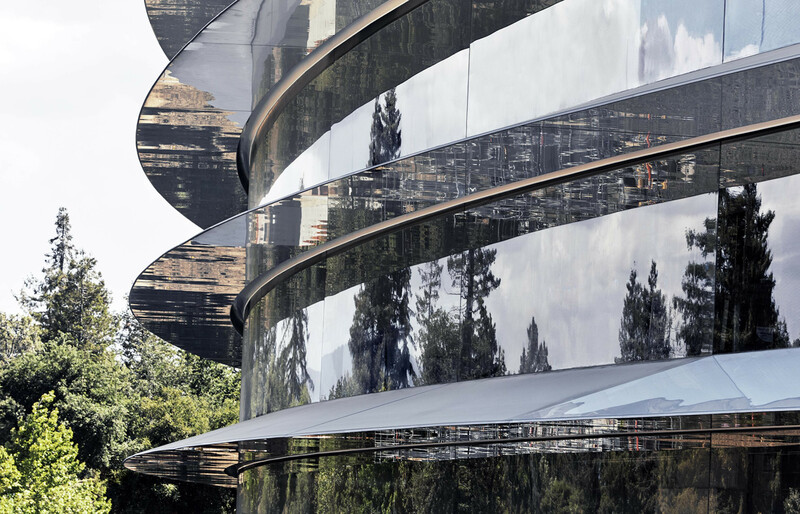 For all the new information around Apple Park and some of the processes involved in building it, see the full story over at the Wall Street Journal. That sterile, boring, chip manufacturing clean room, sterile hospital operating room aesthetic gets to me after a very short while. All of that white on a sunny day will drive a person snow blind. I guess it'd be a lot fuller and more fun when there are actual people inside. No it's not. You have zero taste and class. Someone pissed on his cereal. Chill. You must speak from experience. Do you piss on your cereal? Too much light. Everyone gonna wear glasses. It needs some warm lighting imo. PA trying to make it sound like the iPhone is made in the US. You're a day or 2 late...pretty sure PA already mentioned this. Looks like one of the most boring and sterile places on Earth to work. Looks like a place where people go to die and rest in peace. Its his opinion. It doesn't make it dumb because you don't agree. Idiotic post of the day. I agree. I feel that way about their stores too. But not just them, all who copied them too. Smasung and Microsoft stores are both boring. They all feel like art museaums where everything is for display. The best technology store I ever went to playing hip music and having product on display in a nice fashion is the latest ATT. T-Mobile and Verizon technology stores here in Downtown Chicago. Unlike their typical carriers stores, these stores have themed sections and carry more than just phones. They have speakers, watches, clothing and more. Its more lively with loud music and the walls have banners, pictures, photos of prominent people and everything isnt all white. We get it...whites like everything white and boring. Life is better with color, that is why God gave us the ability to see color. If he wanted everything bland and boring, everything would just be grey...or everything would be in color, but he would have given us eyes like dogs who cant see much or any color. The building itself is awesome and cool looking and hss state of the art technology. But the white everywhere is boring and classless. Absolutely love the design, although I would have chosen a light oak colour wood rather than the whiter colour wood. But very impressive. Defintiely need pf some nee design blood in there. Ive is long in the tooth at this point. Defintiely need of some new design blood in there. Ive is long in the tooth at this point. Uninspiring design. Why all round? And the reflective material is gonna be a strain on the eyes when the rays of the sun reflects off of it. No products will come from this building -- unless they are moving it to China.